I have had the privilege of knowing Sydney Hayduk for years through attending the same schools. Over the last few Fringe festivals, I have seen her grow as an actress, and this show is a shining example of how she has become a wonderful and captivating performer and confidant woman. Her performance this year is an educational, inspiring, entertaining, funny and uplifting production of motivational speaking, energetic dancing, raw and real self expression and more than anything, it is a performance of love. She reminds us that while the world may seem like a mess, that there is always hope and the place to start is by creating a sincere and defiant self love. 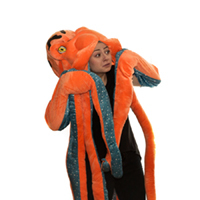 Sydney shares compelling stories and guides us in a journey of embracing our monsters and facing our demons via a stuffed octopus costume. She teaches us about the brain and how society behaves when faced with negativity. She is enrapturing, encouraging and reminiscent of a TED talk, of which I am a huge fan. I have met few people in my life who are such a fountain of knowledge and positivity. I cannot recommend this show enough. It is fun, it is important, and it is an excellent experience.